Updated 04/03/2019 By Alyson Long. Any post on this site may contain affiliate links. If you use them, they cost you nothing extra. We make a small commission. 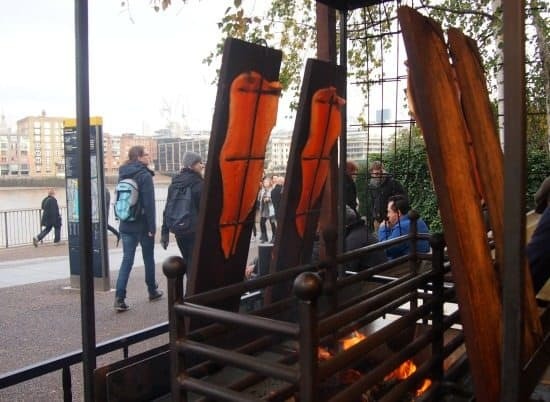 You asked for tips on what to do in London at Christmas time, so I did a bit of hunting around to see what I could find. I’ve spent 8 Christmases in London as a resident and when we lived in Wales I’d come to London most years to see the lights, do some shopping, maybe take in a show. I’m sure you plan on a wonderful few days or weekend in London over Christmas. 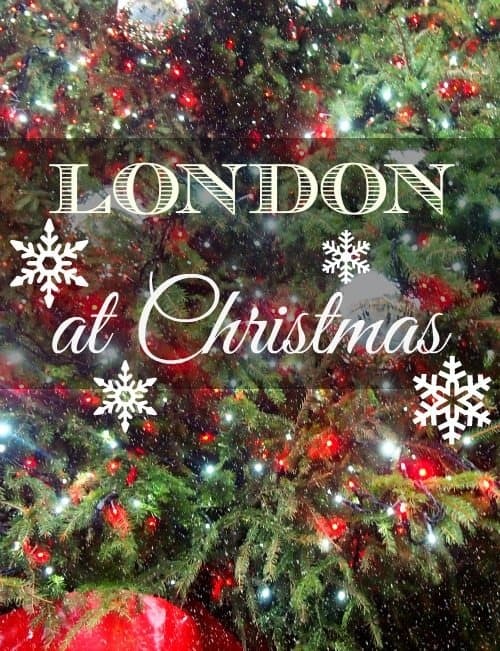 London is always fun at any time of year but at Christmas she has extra magic. 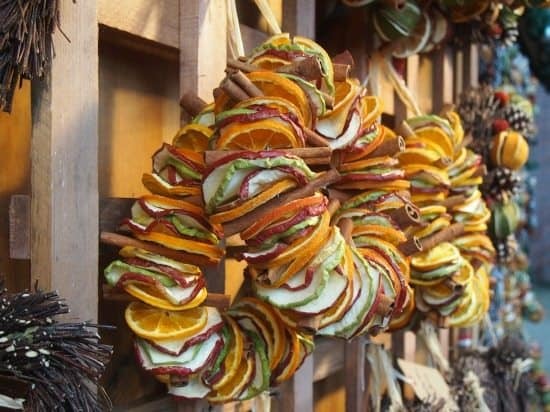 The darkness of the late afternoons helps make the lights and decorations all the more spectacular as you munch on your roasted chestnuts and sip a mulled wine. 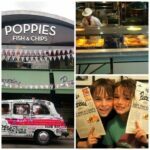 So if you’re thinking of visiting London this Christmas, 2018, we have some up-to date tips and recommendations for you. Some dates are not yet out for 2018, we’re adding confirmed dates as fast as we can. 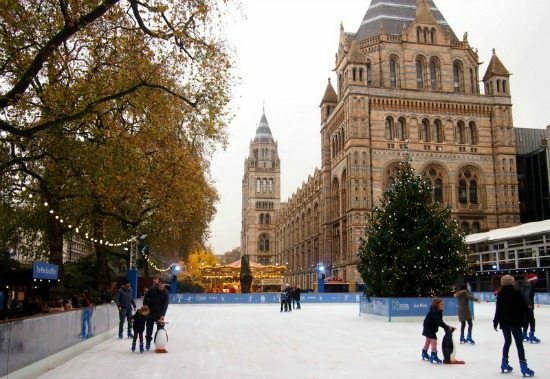 A lot of London’s Christmas events, including the ice rinks, are hugely popular, pre-booking may be the best idea. John Lewis on Oxford St. The most famous tree in the world, the Trafalgar Square tree will be lit on (unconfirmed as yet) December. The tree is an annual gift from Norway to the UK in gratitude for assistance in WW2. 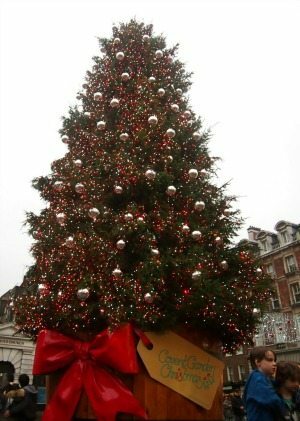 Covent Garden is also boasting a large and impressive real tree this year ( above). Eyeskate at the London Eye. This chap at Covent Garden is new for Christmas 2014 and he’s spectacular. There are one day Christmas Markets and events all over the city, but the biggest and longest running attractions are below. 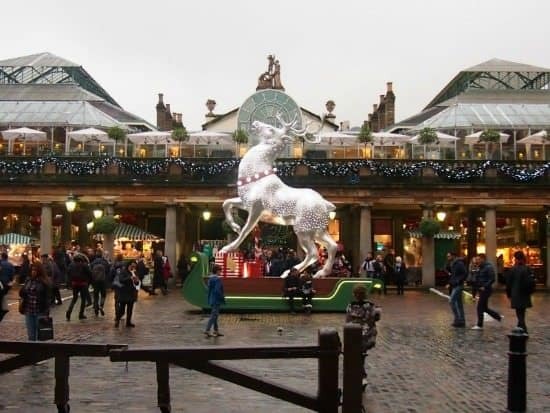 Covent Garden Market runs all year round, but it’s extra special at Christmas. Leicester Square has a small market, a carousel and a scary looking ride. Christmas at Kew, an after dark experience of magical lights at the famous Kew Botanical Gardens. 2018 dates here. Winter Wonderland Hyde Park , 2018 dates above, has it all, ice rink, big wheel, food stalls and a circus. Christmas wreaths at a craft fair smell amazing! This is the quietest day of the year in London, take the opportunity to walk in the parks and see the Chritmas windows and lights. There’s something special about being in London at Christmas time but Christmas day itself in the city is a unique experience. Ripleys Believe it or Not is open. Very few other places will be. We went to Ripleys in New York, I was surprised by how good it is. We’re heading to the London Ripleys in the next few days, so I’ll let you know what it’s like. Ripley’s Believe it or Not, Piccadilly Circus, London review here. The annual Christmas day Serpentine swim in Hyde Park is worth a watch if you’re out and about at 9am. Getting around London is tricky over Christmas, London’s public transport system is excellent, cheap and efficient, but Christmas is the worst time to experience it. The huge crowds of shoppers make life very difficult for most of the Christmas school holiday period and every weekend. On top of the crowds, there are also closures. Remember there is no tube, overground or bus service on Christmas Day in central London and reduced service over the holiday period. Check with Transport for London for latest details. Booking a Transfer from Heathrow into London on Christmas Day or Over the Christmas Period. Several people have asked me about this now. The best I can do is send you here ( opens in new tab).There are cars to pre-book your airport transfer and also bookings available for the Heathrow Express, but check dates and availability ( see below). Taxis can be very expensive in the UK so be cautious and look out for extra charges at Christmas time. The Heathrow Express website here ( opens in new tab), states that there will be maintenance work this Christmas and closures, check this for your dates. 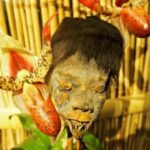 Ripley's Believe It or Not New York. What Did We Think? Hello! We are thinking of visiting London for a 20 year anniversary family trip. I know the ground transportation is all but closed on Christmas Day, but what about Christmas Eve. It was be nice to get there around the 18th and fly back on the 24th before all of the closures. Thanks! You’d have to check with transport for London, but their Christmas schedule for 2019 won’t be announced yet. Last year there were closures on the rail line in from Heathrow over Christmas. Did you mean that or buses and underground actually inside London? Great post, Alyson! London can be truly magical at Christmas time but it is also very busy so it’s good to be prepared for everything and make a plan of action. 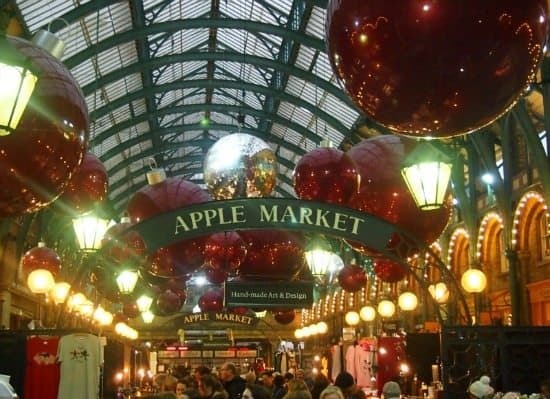 There are some really great Christmas markets dotted around London – both for food and for general shopping. And it’s a great idea to check out one of the outdoor ice rinks – perfect for students, families and everyone really. Will be arriving in London on Christmas Day. Do you know if I could arrange transportation from Heathrow to hotel ahead of time since public transportation is not available? Any suggestions on restaurants would be greatly appreciated. I will be traveling with 2 teenage boys and my husband. Can you check with your hotel to see if they offer that service Maria? Failing that, you’d probably need to pre-book a car service online and importantly…agree a price. You don’t want to turn up and find the taxi drivers wanting to charge you triple time because it’s Christmas. 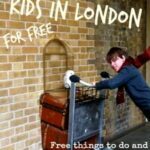 I’ve added a link towards the bottom of the post that gives you a selection of transportation options from Heathrow into Central London. 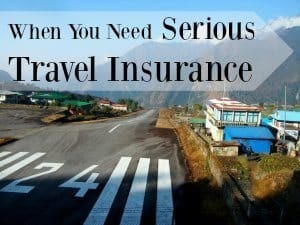 These can be booked in advance and could save you a headache. But it looks to me as if the Heathrow Express is not running Christmas Day due to maintenance. I’ve included a link to the Heathrow Express website above too. You can double check. HI, Ill be in London for Christmas and i would like to go for a traditional lunch in a pub or restaurant without spending a fortune. Most ive seen are 100 Pounds and over. 1st i dont want a 5 courses menu, just just basic, and second im not spending that much for kids..
No, sorry, Christmas day will always be massively expensive because the staff are paid so much more to be away from their own families. It’s not something we’ve ever done, although my husband is a Chef, in London we’ve always been home Christmas day. Most places will be closed. Thank you so much for these informations. We’ll be in London before Christmas to see the lights and a bit of shopping. I’ll keep an eye on your site for updates. Traveling on Christmas Day London, the web site you link to has not been updated since 2013 ?? 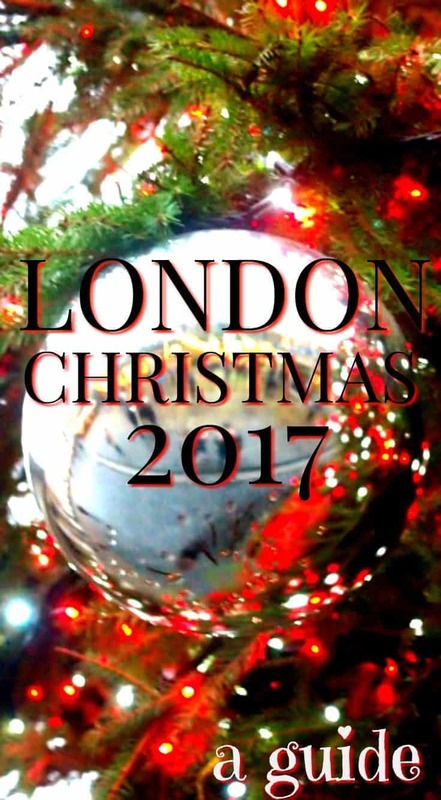 We’ll be in London Dec 20 – 29 2018 and was researching the city and things to do, found your web site. 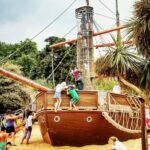 How do I get current information on tourist issued around Christmas? Hmmm… not sure. Will have a look at that link for you…. very little information available yet for Christmas 2018 and New Year 2018 -2019. Transport for London has not announced anything as yet, which I’m not surprised by as it’s only June. Will be updating as soon as details are released. 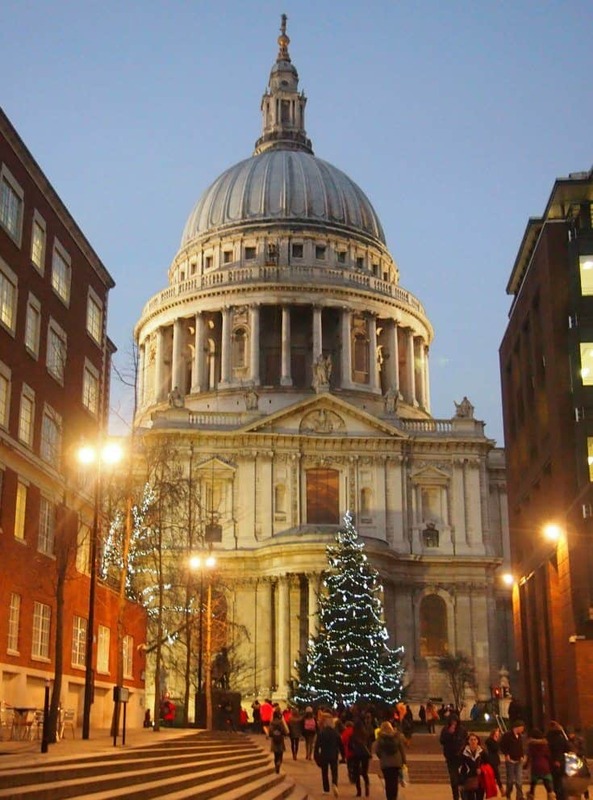 I love London at Christmas time and am so happy to be living here!